Chameleon reptiles are popular because of its ability to change skin color. 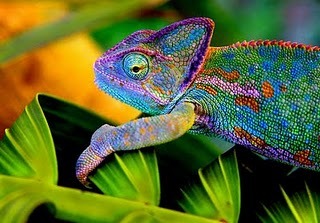 Then what caused the chameleon can change color? There are over 100 species of Chameleon. There can only change color from brown to green and vice versa, but many also have a large collection of stunning color on his body. Chameleon is a kind of reptile belonging to the tribe (family) Agamidae. Many people interpret that chameleons change their skin color as camouflage or a response to the enemy and danger. In fact, in fact not the case. 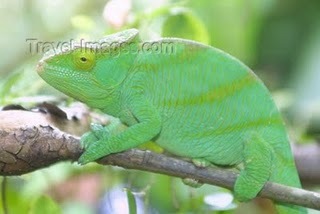 Chameleons do have the ability to change the color of his skin. 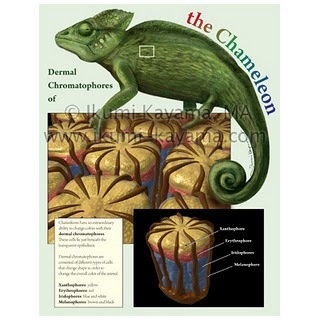 However, chameleons can not change skin to any color, but only to certain colors. Then, why chameleons can change the color of his skin? Of course this is supported by the presence of chameleon functions in the body that supports these functions. When Brown Chameleon wants to bask in the sun, then the Chameleon will change its skin color to green to maximize the reflection of sunlight obtained. When the temperature is cold, Chameleon skin will turn darker to maximize heat absorption. Chameleon male who 'challenged' the other Chameleon can change color to red yellowish. Or when the Chameleon 'fall in love', can also change color to attract attention, such as purple, blue and red. Chameleons have cells beneath the surface of his skin color is transparent. Beneath this layer there are two layers of cells containing pigment of red and yellow (also called chromatophores). Beneath it again there is a layer of cells that reflect blue and white. Then again there is a layer underneath the melanin to brown color (like those of humans).